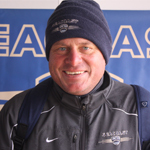 Jason Wisniewski comes to Seacoast United from Fort Wayne, Indiana where he coached for the Fort Wayne Citadel, Fort Wayne Sport Club and Bishop Dwenger High School the past 14 years. In club soccer, he coached his ’93 boys to a state title in 2005 and has coached all levels from “Gigglers and Dribblers” to U18 Premier Boys. At the high school level, Jason’s teams won 8 Conference, 8 Sectional, 6 Regional, 3 Semi-State and 2 Indiana State Championships with over 200 teams competing annually. He left Bishop Dwenger with a 14 year record of 219-49-16. He was named the Indiana Coaches of Girls Sports Association’s Soccer Coach of the Year in 2005 and 2006. He was also voted the Indiana Soccer Coaches Association’s Girls High School Coach of the Year in 2006. Jason played soccer at Hofstra University and Robert Morris College (University). He currently holds an NSCAA National Diploma and USSF “D” license equivalency. He is an English teacher at Somersworth H.S. and coaches the Girls’ Varsity Soccer Team at Dover H.S. He lives in Dover, NH with his wife, Laurie and daughter, Zoe. His family also includes step-son, Patrick, who attends Michigan State University and step-son, Bradley, who attends the University of Tampa.